The term “doing more with less” is being used increasingly liberally by organizations today. However, there are often gaping holes between what is asked and what is executed. In many cases, organizations fail to understand or recognize the detrimental effect their “do more with less” approach has on employees’ productivity and rising frustration levels. The concept needs to be revolutionized. For decades, managers have been told to “do more with less,” which they interpret as raising the bar on employee goals and expectations while spending less money. Employees typically receive the message as involving working longer hours or accomplishing more tasks without the support of extra resources. This approach quickly builds frustration. More significantly, it wears down your most motivated and loyal employees. These are employees who want to succeed at their jobs, but feel that roadblocks and constraints are continually put in their way. So how can leaders ask employees to “do more with less” without causing frustration? Instead of making vague statements, setting unrealistic goals, and expecting employees to do more without providing additional resources, leaders need to unleash the full potential in their employees. 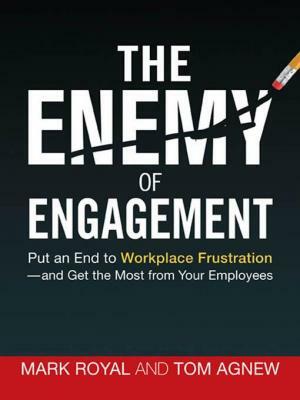 We all know about the importance of engaging employees through motivational tactics, but engagement only moves employees so far. The real answer lies in employee enablement. Managers must help to create work environments where employees are supported by processes and information that help them do their jobs efficiently; in turn, decreasing frustration and allowing for improved productivity. How can leaders create a more enabling environment to increase productivity? 1. Create a culture of dialogue: Instead of relying on annual review time to discuss performance, managers must create a culture of open communication with their teams and continuously engage in conversations about goals and priorities to help employees focus on the highest value tasks throughout the year. When frustration is allowed to silently simmer, everyone loses. 2. Grant appropriate authority: It’s important for managers to provide employees with explicit decision-making authority, encourage them to come forward with innovative suggestions for improving the organization, and reinforce employee creativity by appropriately translating ideas into action. 3. Identify support gaps. A lack of support creates significant productivity issues. In order to avoid employee burnout, managers must ensure employees have the necessary resources to carry out their roles successfully. 4. Develop employees. In order to turn high-potential employees into high-performing members of an organization, companies must place a high value on job-related training. By offering programs for learning and development, organizations will get more out of their people. 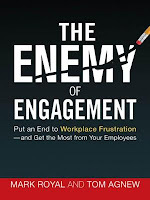 Mark Royal and Tom Agnew are principals in Hay Group’s employee-research division and co-authors of The Enemy of Engagement: Put an End to Workplace Frustration—and Get the Most From Your Employees (Amacom, 2011). Royal is based in Chicago and Agnew is based in New York. I think the role of a leader in creating an environment that enables high performance is often overlooked. All too frequently the focus is on the follower or the leader and not on the environment. I think leadership needs to be considered equally from all these three perspectives. I agree, the organisational 'culture' and 'environment' plays a crucial role and is often overlooked. 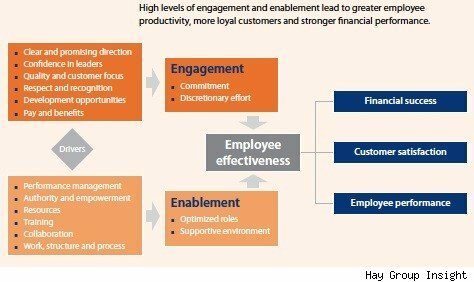 I found this picture really enlightening, to show the synergy between engaging employees and managing their performance. It gave me food-for-thought about how we tell this story to our supervisors, and encourage them to pick up both batons (or rather to see them as the same baton). Great posting. The organisational culture and environment is absolutely key to successful engagement. Today's employees recognise that simply 'paying lip service' to values is not good enough. What is the most important element of engagement? Integrity. Are the values of your business well reflected in the day-to-day behaviours of the culture? “You cannot spin to employees that your company is the best place to work for if they know it’s a bullying culture,” says Nita Clarke, director of Involvement and Participation Association UK, who spoke recently on the focal points of engagement to enhance business performance.